Do you see God as a Mechanic or a Mathematician, integrating the universe like an equation that needs solving? Or do you see Him as an Artist, crafting the universe like a painter lovingly paints brushstrokes on the infinite canvas? Do you think God sees us as problems that need fixing, sinful beings stuck in an ever-continuing series of sins and troubles, like a cosmic IT Tech trying to rid a computer of pop-up viruses? Or do you think God sees us as His artwork, part of His ever-creative expression, a work of beauty and a part of His Imago Dei? Our perception of God—for better or worse—really does make a difference. It affects how we see ourselves, how we live our lives, how we treat others, how we interact with God, and also how we allow God to interact with us. It is no small thing. My friend, Bob Kilpatrick, along with his son, Joel Kilpatrick, have written a book on this very important paradigm. Rather than casting God as the eternal Mechanic, he helps us see God as the passionate, visionary, grace-filled Artist God who views us as His evolving masterpieces. And equally important, he helps us see ourselves and our lives through God’s eyes. 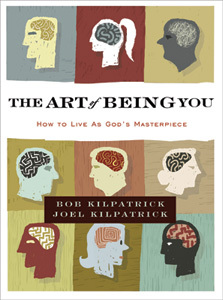 His book, The Art of Being You (Zondervan), is available now, and I highly recommend it. Many of us—even us artists—were taught that God is “in the business of fixing broken people,” and I think this is a modernist metaphor that misses the point of God’s nature and the source of His grace. More true is that God is in the process of completing us, his artwork, into his masterpieces. He isn’t there to fix us, repair us, or overhaul us. Instead, He gently molds us, transforms us, loves us, and ultimately makes us, His works of art, into masterpieces, so that He be glorified in us. Posted in art, Artist Profile, Blog, christianity, drama, faith, Imagine That, made in the image of God, movies, music, Poetry, worship, WritingTagged art of being you, Bob KilpatrickBookmark the permalink. For me, these words fall on a barren place in my soul. I’ve struggled with this image of myself for too many years and have no resolve. My thinking is that there must be a simplicity to this that escapes me. Were I to internalize this truth, it truly would change my life… forever.